Las Vegas will stage National Plug-in Day in the parking lot of the NV Energy Pearson Building at 6226 W. Sahara Avenue from 10 AM to 4 PM. 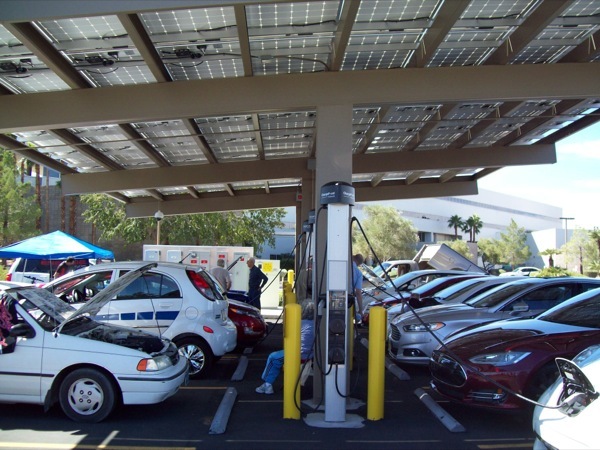 At that site, a photovoltaic solar cell canopy provides electric power to eight ChargePoint electric vehicle supply equipment stations with a total of 13 SAE J1772 AC Level 2 plugs available. A separate source for 110-Volt AC power will also be provided for non-standard plug-in electric vehicles. Booth space is available to vendors, academic, and non-profit organizations to stage informational displays. Electric car rides will also be given by vehicle owners to any interested visitors. Refreshments will be available during the event. Come celebrate an electric car lifestyle with us and experience your own EV grin!